The Ministry of Public Health will stop the rental of drug bonds, in particular, one at Sussex Street, Charlestown by the end of the year, government said Thursday. Minister of Public Health, Volda Lawrence reminded the media that during the examination of Budget Estimates in 2017, she had indicated that the controversial rental of the Sussex street drug bond would be no more by the end of this year. 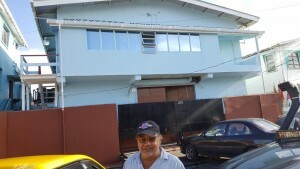 Her assurance came against the background of her response to a question in Guyana’s Parliament by Attorney-at-Law, Anil Nandlall that showed that GY$264.5 million to Linden Holdings Incorporated from July 2016 to March 2018 as rent for the building located at 26 Sussex Street, Albouystown, Georgetown. The bond is currently being rented by the ministry to house a CT Scan machine. This expensive piece of equipment requires stringent specifications for storage and, according to the minister, the bond fits these requirements. The machine is to be sent to the Bartica Regional Hospital upon completion of a building to install the equipment. This building at Bartica is currently under construction and will be completed shortly. “As soon as they (the regional authorities give us clearance that the room is ready, we are ready to remove that CT scanner to Bartica and give up that bond. As a matter of fact, I am on record saying that as of the 31st December 2018 the Ministry of Public Health will not be renting any more bonds,” Minister Lawrence was quoted by government’s Department of Public Information (DPI). The ministry has budgeted for the construction of a drug bond in Kingston, Georgetown while expansion work on the Diamond bond is underway. Additionally, the ministry’s adoption of a new procurement system for drugs and medical supplies will require them to have adequate, specified and suitable spaces for the storage of these supplies. The rental of the bond on Sussex Street from Linden Holdings Inc; whose principal is People’s National Congress Reform member, Lawrence “Larry” Singh, dates back to 2016 when the opposition People’s Progressive Party Civic (PPPC) had raised concerns about the rental of the facility.